For many of us, springtime is our favorite time of year. The flowers are in bloom, the sun is shining; it’s like Mother Nature herself is begging us to come out and play. But then on the other hand, some of us think springtime means one thing – 90 days until bathing suit season. Aaagh!!! Unfortunately when the panic sets in about shedding the winter coat and revealing what we’ve been stealth-fully covering up for the last few months, so does the urge to try the newest and craziest weight loss fads, which usually means an incredibly unhealthy fad diet. Well in hopes of helping you resist the temptation to try a rapid weight loss ( even faster weight gaining) gimmick, and instead try making healthy lifestyle changes, we’re sharing this article with you. Since the tummy is usually the culprit of most of the stress between springtime and the summer months, we thought we’d share James Duigan’s (celebrity trainer) tips for taming your tummy. To get started, you’ll have to figure out… what tummy type are you?! James, who sculpts supermodels Elle Macpherson and Rosie Huntingdon-Whiteley among others, insists there is no ‘one size fits all’ method for getting a flat belly. Instead, he’s identified five key ‘tummy types,’ all of which require a different approach to achieve successful toning. The spare tire: This is one of the easiest tummy troubles to eliminate because it’s caused by eating the wrong foods and not exercising enough. Luckily, this ‘spare tire’ is one of the easiest tummy troubles to eliminate as, according to James, it’s caused by eating the wrong foods and not exercising enough. If you exercise very little, eat lots of sugar and refined carbohydrates in products like biscuits, cakes and white bread, or rely on starchy carbs like pasta and rice, you you probably have an overweight tummy with accompanying fat on your legs and hips,’ says James. Once you cut out alcohol for two weeks, it’s time to overhaul your diet. ‘In a nutshell, eat well and move more,’ says James. Avoid low-fat and so-called ‘diet’ snacks. ‘These pre-packaged products are often packed full of chemicals, refined sugar, salt and preservatives to give them flavor. Stress tummy: These types are typically over-achievers with perfectionist personalities. Magnesium is a calming mineral to help soothe a stressed belly. James advises eating lots of magnesium-rich foods such as dark green leafy vegetables, nuts and seeds. Stress-busting stretches and yoga poses at night time can help to lower cortisol levels, while chamomile teas or James’ own Bodyism Body Serenity supplement (bodyism.com) can also help the body unwind. These women are likely to be busy moms or have demanding careers. ‘They may even be a gym junkie, but stuck in a workout-and-diet rut, perhaps always eating the same foods and doing the same routine at the gym, which keeps you slim but leaves you with a lower belly that spoils your silhouette,’ says James. Good nutrition and plenty of fiber are essential to improve digestive conditions such as inflammation, bloating and constipation, which can make a pooch tummy worse. Green leafy vegetables, oat bran and whole grains are good, natural sources of fiber. The Mommy tummy: Women with these bellies have usually given birth in the past few years, and, being a typical mum, have little time for themselves. Try to eat good fats — found in sources such as nuts, oils and olives — every day. ‘Not only do they help you burn fat and absorb vitamins from food effectively, they also help combat tiredness — a big help for tired moms,’ says James. 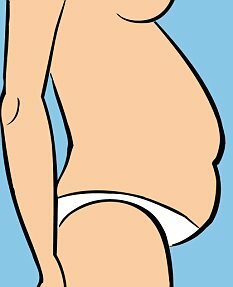 Bloated tummies: These are often flat in the morning, but swell throughout the day with gas or indigestion.